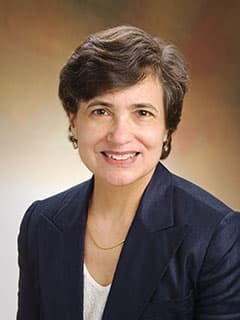 Researchers at the Center for Childhood Cancer Research including Carolyn A. Felix, MD, are investigating the role of the TOP2 protein in the DNA damage that leads to translocations of the MLL(KMT2A) gene and other chromosomal translocations that are central to the leukemia pathogenesis. Translocations and other rearrangements of the MLL gene at chromosome band 11q23 are the most common molecular abnormalities in acute leukemias of infants less than one year old. MLL translocations and a number of other translocations also are observed in leukemias that occur as a second cancer following chemotherapy for a first cancer with drugs that have TOP2 as their target. Infant leukemias and secondary leukemias are clinically important because both have a poor prognosis and are often fatal. Using molecular tools developed at the Center for Childhood Cancer Research, researchers have determined that actively engaged TOP2 cleavage complexes, which form when the DNA cutting protein TOP2 covalently binds to DNA, act as functional chromatin elements in genes that are involved in translocations. The results from these studies may aid in the development of a strategy to recognize TOP2 cleavage complexes as precursor lesions to chromosomal translocations, as well as a means to discover novel TOP2-directed anticancer drugs that continue to kill cancer cells with less probability of causing leukemia as a second cancer.